There's two things here in Weilerbach that are quite persistent; bells (nice) and slugs (ICK!). 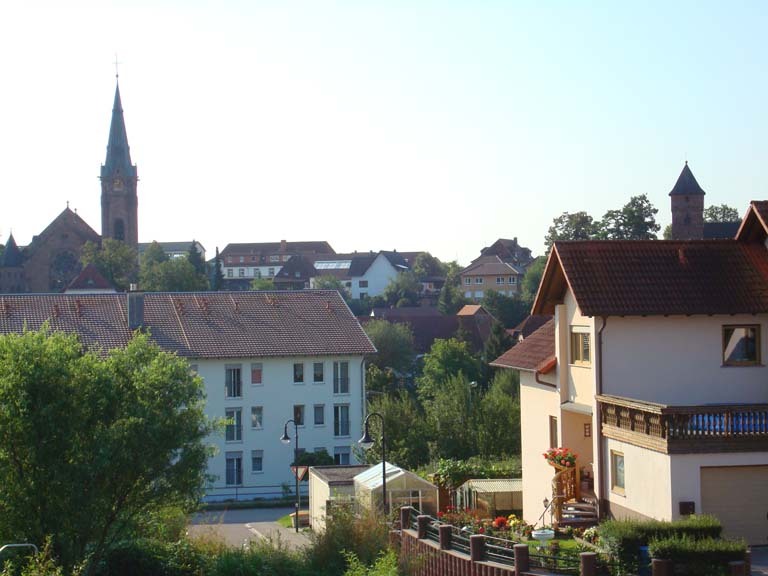 There are two beautiful churches here in our village, here in a picture taken from our study window. One has a bell than chimes every fifteen minutes, 24 hours a day. It took us a bit to figure out exactly what the chimes met. At a quarter past a smaller bell chimes twice, half past four times, 45 past six time. On the hour, eight small chimes and then the big bell takes over and gongs for each hour for the time of day. So at noon you're going to hear 20 chimes/gongs. It's actually very nice and kind of reassuring. Maybe a little tiring in the night if you happen to be laying awake. You can't help counting the chimes/gongs so you know just what time it is and how long you've not been asleep. For some reason, at 6:30 AM the church bells go crazy and seem to go on endlessly. I think it just their way of telling the German countryside to get up and get started with a new day. Now the slug issue is something else. I don't like squiggly, squirmy things. I hate worms. Growing up my dad had to bait my fishhook for me. I don't even like seeing a horde of ants scurrying along end to end. But slugs are the worst. In the morning, when it's cool and the dew covers everything, the slugs are on the move; not very fast of course. You can see them making their way through the grass to the driveway. 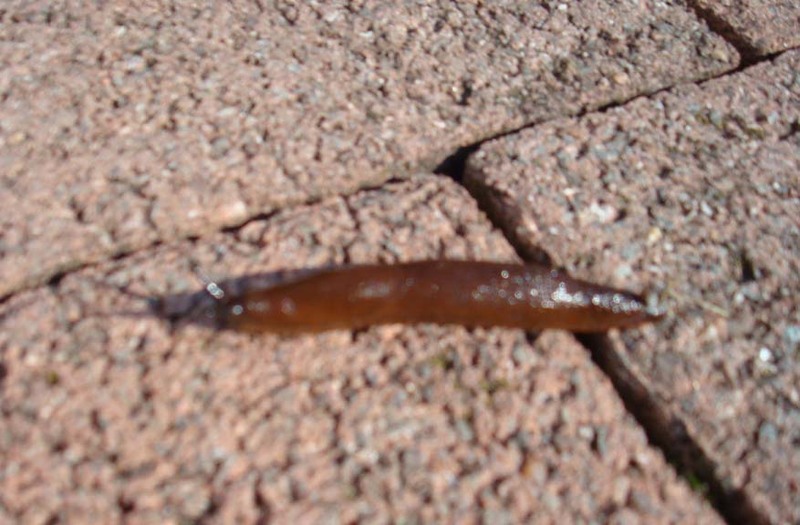 Those that are already squirming across our brick driveway are leaving their slimy trail behind them. Disgusting!! There's always ten or twelve making their trip across the bricks. If I back the car to the street I'm going to squish at least a couple. ICK!! 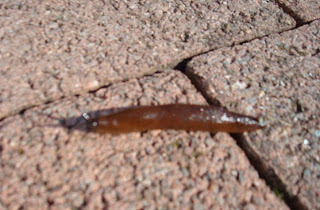 Those that aren't fast enough run out of slime and get trapped on the bricks and get zapped by the sun as the day warms up, leaving disgusting slug carcasses all over the driveway. Jeff had to take this picture for me. ICK!! I mentioned the slugs to our landlord. He said, "Mit dem haus, oder ohne das haus?" With the house or without the house? I had to think about that for a moment and then realized what he was asking. With the house, a snail, or without, a slug. Yeah, we have squirmy snails too. ICK! !